Today is my last day of school! The second I finish my final I am moving into my summer abode! The space is already furnished so any decorating will be minimal, but I am still eager to give it my own personal touch. My friend who owns the loft and whom Sarah Beth (If I haven't mentioned her already she is my best friend and summer roommate!) and I are renting from is leaving her bedding and letting me use it for the summer. It is perfect because any bedding I was planning on getting was going to be mimicked after what she already had because I loved it so much. The preppy navy and white combo with a little hint of orange is perfect. 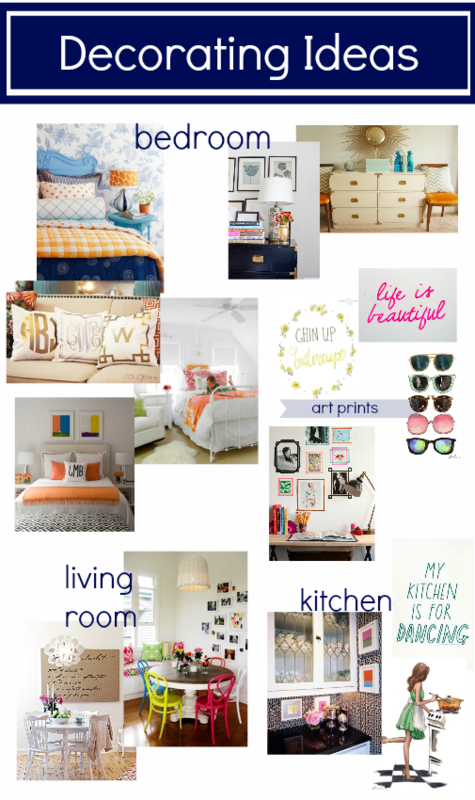 Below is an assortment of some decorating ideas to add to and give the space my own personal touch! -I plan on keeping the bedroom light with lots of white, while adding a little more navy and orange and a fun monogram throw pillow. -I would love to have a full gallery wall, but with this living arrangement only being for the summer, I want to hang up simple prints framed with washi tape to make it more temporary. -What I'm most excited about is an old campaign dresser my mom and I found in my grandmothers storage that we had repainted white and had the hardware polished. -Sarah Beth and my's silly friends who lived there before seemed to think it was unnecessary to have any kind of table in the living room. That was the first thing we both said when we decided we were living in the loft is that we needed a table (We aren't about eating every meal on the couch). We are using my families old light wood circle dining table and a set of random dining room chairs. The chairs were originally painted lime green, turquoise and hot pink, similar to ones pictured above. Cute but not exactly what we were going for, so they got repainted a creamy white to keep things neutral. -Lastly, a couple picture frames and some framed prints in the kitchen will help bring it all together and make it feel like a place of our own. I can't wait to get decorating!